Getting from point A to point B in Metro Manila is a struggle. Commuters squeeze into jam-packed trains and rickety buses and jeeps. Motorists spend long hours stuck in gridlock. Everyone is exposed to toxic air. Road travel is risky. In 2011, 10 road accidents took place every hour in the Philippines. Every day of that year, five people died and 79 people were hurt in those accidents. How can we move people —including the poor, the children, the elderly, and persons with disability— safely and easily in our megacity? We can learn four lessons from Guangzhou; the Chinese megacity’s award-winning transport model moves people, not cars. 1. Build an efficient mass transit system. Eight out of 10 people in Metro Manila take public transport, yet they don’t have much fun doing so: they squeeze into rickety buses, jeeps, tricycles, and jam-packed trains. Over 450,000 people take the MRT3 daily. On the other hand, Guangzhou’s transport model increases mobility, curbs greenhouse gas emissions, and improves safety and access for cyclists and people on foot. No wonder the Chinese megacity won the 2011 Sustainable Transport Award. The bus rapid transit (BRT) in Guangzhou moves 800,000 people per day. A BRT is a system that combines the efficiency of trains with the flexibility of buses. Efficiency is achieved through improved vehicles and infrastructure. The buses in the system run on liquefied petroleum gas. The result: a mass transit system that is good for the planet. Guangzhou’s BRT cuts carbon emissions by 86,000 tons per year. It integrates with bike lanes, bike share, and metro stations. Using only one smart card, commuters can pay for their rides on the bus, BRT, metro, bike share, and taxi. This payment system allows users to easily shift to the other modes. Studies conducted by the Institute for Transportation and Development Policy (ITDP) show that it saves commuters 32 million passenger hours each year. ITDP studies show that commuters spent 4.9 Chinese yuan (about Php32) on bus fare in December 2009. The BRT opened in February 2010. By August 2010, commuters spent almost half—2.6 Chinese yuan (about Php17)—on BRT fare. Monthly multiple trip discounts, flat fares for the BRT, and free transfers within BRT stations have further cut the cost of fares. The median cash fare is 2 yuan (about Php13); the median smart card fare is 1.5 yuan (about Php9.8). Cyclists in Metro Manila put up with the dirty air, the reckless drivers, and the lack of bicycle lanes. Yet they persist in biking because it cuts travel costs and times. In contrast, Guangzhou is a haven for cyclists. They can rent any of the 5,000 bikes in 113 bike-sharing stations in the city; the first hour of use is free. They can also ride their bikes on a protected bicycle lane that runs along the entire length of the 22.5-kilometer BRT system. 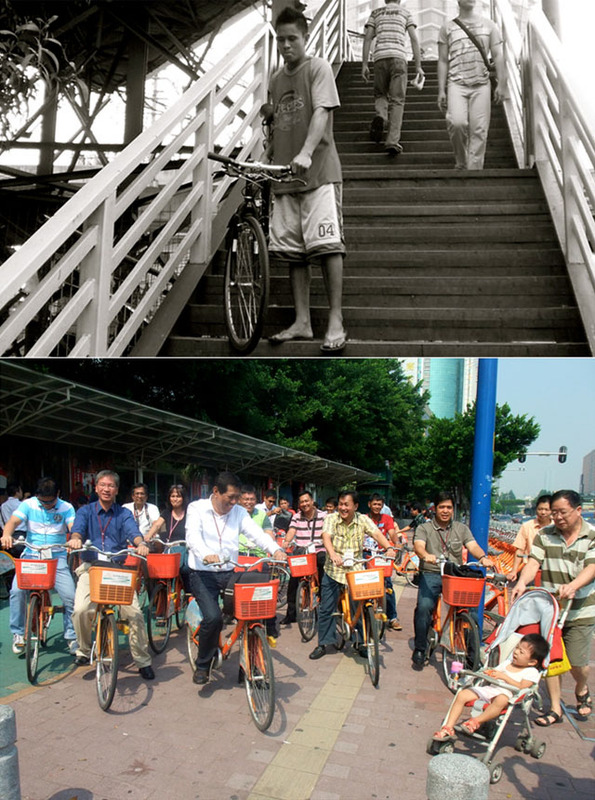 Metro Manila’s problem (top): Cyclists put up with the dirty air, the reckless drivers, and the lack of bicycle facilitiesGuangzhou’s solution (bottom): Create a haven for cyclists. During a study tour to the Chinese megacity, key Filipino officials, including Marikina mayor Del De Guzman (2nd from left), Caloocan vice-mayor Edgar Erice (in white), MMDA chairman Francis Tolentino (in yellow), and Muntinlupa mayor Aldrin San Pedro (in brown) pedaleda few ofthe 5,000 bikes in 113 bike-sharing stations in the city; the first hour of use is free. They biked on a protected bicycle lane that runs along the entire length of the 22.5-kilometer BRT system. Walking in Metro Manila is no walk in the park. People on foot are “corralled into very narrow spaces to ensure that vehicle flow is not affected,” write James Leather, Herbert Fabian, Sudhir Gota, and Alvin Mejia in “Walkability and Pedestrian Facilities in Asian Cities”. The sidewalks are narrow. Vendors and vehicles often encroach on what little space there is. The footbridges are often steep, unfriendly, and inconveniently located. The people avoid using them because it often takes more time and energy to do so. Metro Manila’s problem (left): Walking in the megacity is no walk in the park. People on foot are made to squeeze into very narrow spaces to ensure that vehicle flow is not affected.Guangzhou’s solution (right): Make walking easy. Build walkways that are wide and gently sloping. Install ramps that make crossing more convenient for people with goods and bicycles. Guangzhou is sweet to its pedestrians. The walkways in the Chinese megacity are wide and gently sloping. The sidewalks are also wide; they are clear, continuous, and brightly lit at night. The street crossings are simple, direct, and at street level. Metro Manila residents are starved for green, open spaces. They yearn for parks where they can relax and enjoy nature. These spaces are rare in the megacity. In Guangzhou, residents enjoy 2,100 kilometers of lush greenways. Greenways are “safe, quiet, and green spaces for exercise, games, and fun,” says Bram van Ooijen, engineer in charge of non-motorized transport and parking at the China office of ITDP. Metro Manila’s problem (left): Green and open spaces are rare in the megacity. People yearn for outdoor spaces where they can hang out with family and friends. Guangzhou’s solution (right): Create greenways or quiet, green, and carfree spaces for fun and exercise. Link these greenways to the places where people live and take public transport so that they form the backbone of walking and cycling networks. The greenways have improved the quality of life of Guangzhou residents. Families walk, play, and hang out in these calm, car-free spaces. The greenways žhave also boosted tourism and “land values around the greenways by as much as 30%, lowered CO2 emissions, and improved the people’s health,” says van Ooijen.